Rail features four easily accessible grasping points. Attaches to hollywood style home bed frame. Comes with 8" mounting bracket for a secure fit. 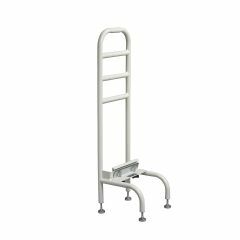 Designed to provide assistance getting in and out of home bed. Adjustable to fit most beds. 11" wide frame for one or two handed use. I purchased this rail for my mother, who had a stroke with one-sided weakness. She can now get out of bed with relative ease. It is sturdy, installs easily and does not get in the way when sleeping or making the bed. The feet keep the weight on the floor, not on the mattress, which gives great leverage. I may buy another one for the other side of the bed. I am writing this for my elderly mother who has been using this for the past week. She lives alone and used to sleep on her recliner because she could not get in and out of bed. She now feels more independent because she can get in and out of bed with ease. She has home health care visit once a week and they have nothing but praise for this product. can you tell me how this works? I have Parkinson's and have a very hard time getting out of bed.